Can We Finally Change the NFL’s Archaic OT Rules? At long last, Tom Brady’s season-long quest for retribution under the despotic rule of Roger Goodell has reached its satisfying conclusion. 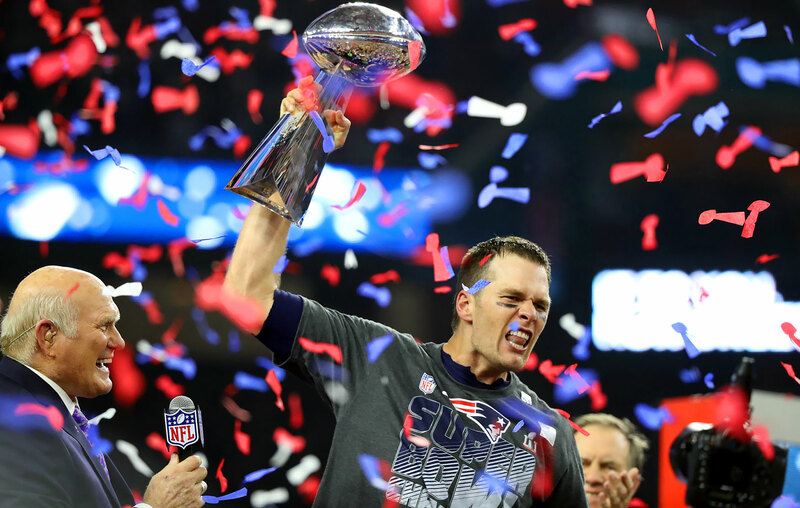 The New England Patriots defeated the Atlanta Falcons in Super Bowl LI by a score of 34-28, overcoming a NFL high 25 point deficit to seal the victory in overtime. While NFL fans nationwide may not harbor such positive sentiments towards the Patriots and their victory, the Michigan fan within me will always hold a soft spot for our former quarterback. Perhaps breaking seven records makes it easier to root for him. This year’s Super Bowl seemed to have it all: another miraculous catch, controversial commercials, and a Lady Gaga halftime performance that transported her 167 million viewers back to 2008. Unfortunately, bundled alongside the revelry was a pervasive sense of discontent surrounding the game’s gripping conclusion, attributable only to the manner in which it ended: overtime. Yes, the NFL must yet again face the derisive scorns of fans who exude such a passionate distaste for the abomination that is the League’s overtime rules. At their core, overtime in the NFL appears relatively straightforward, implementing a sudden-death continuation of the game with minimal adjustments. However, the rules as they currently exist are woefully unfair, rewarding luck more than skill and cheating teams out of the opportunity to defend themselves. While such arguments may appear redundant, overtime rules desperately need to change. Doing so presents an opportunity to craft a fairer, more exciting and statistically valid end to contests that just can’t be concluded in 60 minutes. For NFL leadership and fans alike, it’s easy to ignore the problems plaguing overtime competition; they don’t occur all that often. Very few NFL games ever reach overtime, placing potential revisions of their rules as a last priority. In fact, Super Bowl LI was the first to reach overtime in the League’s history. However, this year’s NFL season quickly exposed some of the major negative results of overtime in its current formulation. In particular, these flaws manifested themselves in two dissatisfying contests, both ending in ties. In general, only around 4% of overtime competitions ever reach a tie. This year, two ties occurred within a week, between the Seahawks and Cardinals, and Redskins and Bengals, respectively. If NFL fans can agree on anything, it’s that they hate ties. After all, this is the NFL, not the Premier League. But tied games only scratch the surface of the problems plaguing the current NFL overtime. The core problem is straightforward; currently, NFL overtime rules allow for the possibility of one team never even receiving the ball, denying them their right to a rebuttal. Following modifications in 2014, teams that score a field goal in overtime do not automatically win by sudden death rule, as the other team is given an opportunity with the ball. Touchdowns, however, still end the game automatically. Such a policy seems inherently unfair, especially for the Falcons. Atlanta hypothetically could have won Super Bowl LI, given they had a chance with the ball in overtime. Alas, they were never given that chance. With rules that fail to explicitly guarantee equal opportunities for rebuttal, the end result is a system heavily reliant on luck rather than skill. For overtime, a mere coin toss determines who starts with the ball, giving the winning team a massively unbalanced advantage. We need only parse over the numbers to prove this statement true. Since 1994, teams winning the overtime coin toss won nearly 60% of the time, with around 35% winning on their first possession. Even worse, of teams losing the coin toss, over 25% never even touched the football. In an oversimplified sense, this means teams winning the coin toss receive a nearly ten percentage point boost in their chances at victory for no reason other than gravity being on their side. Overall, an overtime unduly influenced by a coin flip violates one of the core maxims of competition: no defenseless plays. The logic behind this seemingly empty platitude is rather intuitive upon further examination. For any scoring play in an athletic competition, the opposing team must have the opportunity to defend itself, preventing points from being scored. This is why, in nearly every sport today, whenever an “offense” takes to the playing field, a “defense” stands in their way. This makes sports fun, competitive and entertaining. Without this simple maxim, athletes would no longer compete against other athletics, instead competing against their own personal bests. In a direct sense, overtime in the NFL does not violate this principle. Teams receiving the ball first must still pass through the opposition’s defense if they wish to score. However, it is not the sport itself that causes the violation, but the coin flip. As shown earlier, winners of the coin flip win a solid advantage in odds of winning the entire game. This advantage is obtained purely through luck, without any skill or defense involved. The losing team becomes immediately disadvantaged, through no fault of their own, thereby violating the maxim of defenseless plays and making a once-fair competition a victim of luck. So what do we do? Simply utilize college overtime rules. The NCAA’s system of overtime in football games directly solves nearly every problem posed by the NFL’s alternative. College overtime is fair, giving each team the opportunity to play both defence and offense regardless of the result of a coin flip. Additionally, there is little advantage, if any, to going first or last, since each team receives the ball at least once. If anything, the team going first is at a disadvantage, as approximately 54% of OT wins come from the team going last. Furthermore, college overtime is just plain fun. Focusing on red-zone drives creates a fast paced and gripping environment in which to see a hard fought game on the gridiron come to an end, without enduring the more dull aspects of the sport. Last but not least, no more ties. To be fair, one could argue going last in college overtime gives a team the advantage of asymmetric information, as they could see how the first team performed and adjust their strategy accordingly. It is true that college overtime suffers from this dilemma; but, so do nearly all sports. In a possession based game, somebody has to win possession first. Basketball solves this problem with a jump-ball, while hockey implements a faceoff. Football has no such process for determining possession, leaving this task to a coin. However, college OT ameliorates this problem by alternating the order of who begins with the ball in subsequent OT periods. Therefore, any supposed advantage to going last in the first overtime disappears by the second overtime period. For years, fans of the NFL have suffered through clunky, unfair and plain awful overtime rules. With their problems exposed during the biggest game of the year, hopefully fans and NFL leadership alike will recognize this impetus for change and work proactively to make overtime entertaining and equitable once again. Wah, Wah, Wah…it’s WHY, if a team is in position to score in the waning seconds of regulation, that it should consider ‘going for it’, that going for the tie COULD leave them at the mercy of a coin toss, and the possibility that a special teams or defense mistake could cost them the game w/o opportunity to answer back. Witness the Oakland Raider’s 35-34 victory over the Saints in Week 1 of the 2016 season. When the Raiders were down by 34-27, and scored a touchdown with 47 seconds left, Coach Del Rio elected to ‘go for two’, which succeeded. I’d like to see more gutsy calls like that! Changing the ‘sudden death’ rule to not allow the game to end on a field goal after the kickoff and initial possession made sense…NFL play tends to be overly conservative and unexciting as it is. Football does have a process for determining possession. It was last used by the now defunct XFL.